Señora Lipani teaches Spanish to grades 6-8 since September 2015. Señora Lipani is enthusiastic to share her expertise in the Spanish language and love for the culture with her students. Her classes are designed to prepare them for high school level Spanish, or simply to just teach them “how to learn a second language” at the high school level. 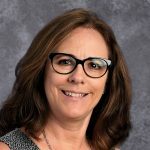 After teaching Spanish and Italian for 15 years at St. Mary´s HS, and most recently serving as the Modern Language Dept chairperson, Señora Lipani has taught all levels of language from beginners through AP and college credit courses. Her prior experience includes elementary school language teaching. She holds a Master´s Degree in Education/Spanish from Queens College. Outside of school, she loves spending time with her family, especially her grandchildren.